Lord knows we have had a gorgeous November here in the Pacific Northwest. More sunny days than I can ever remember in this grayest of months. But now, the leaves are off the trees for good. There is no more pretending that this is what the weather folks call a “shoulder season.” It is winter—no matter the calendar technicalities—and we won’t see leaves again until March and in a full-throated burst, April. In years past—when I was younger—I found this time of year to be a bit depressing. Sure, the bones of the trees are simultaneously awe-inspiring and reassuring. I love to be able to see each tiny branch that is usually hidden by a cloak of leaves, and it always delights me to be able to spy on the birds’ nests that have been built over the year. But fundamentally, the treeless months have always felt like dormancy, like death. This year, it is different. When I look into the branchless trees of my yard and my neighborhood, all I can see are the buds. Yes, they are already there even though the leaves are not yet raked from the ground. 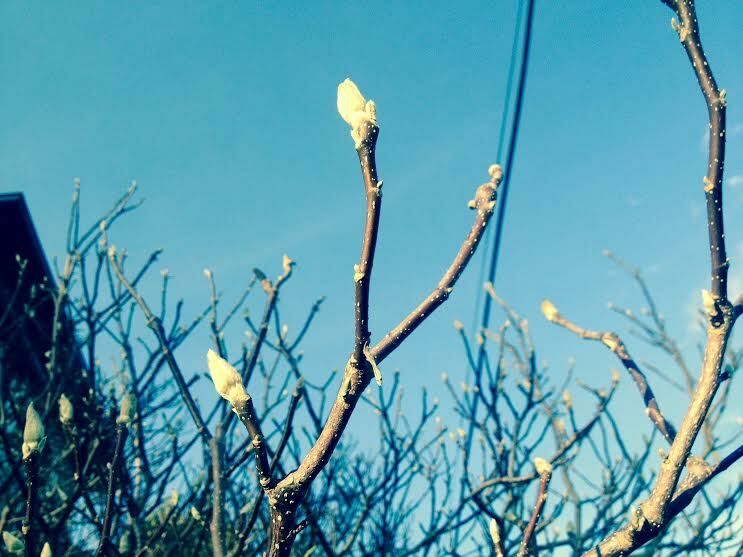 Here it is not yet Christmas, and on the tips of every branch are the buds that will be next spring’s leaves. In fact, it feels as if the new buds actually pushed the old leaves right off the trees. At first I found this reassuring. See: there is birth in the face of death, the life cycle continues. But as I notice it day after day, I find it to be a little unsettling. It makes the life force seem less benign and more dependent on destruction. It feels less controllable, less like snow gently giving way to chicks and lambs and more like the baby new year shoving the old man off the cliff. And yet and yet, there is something exciting about that creative destruction, too. There is something that suggests that the mystery is just too big for the cultural stories we tell ourselves. It suggests that the forces of life and death are one and the same and that we’d better wake up or we won’t witness all that holy madness before we are its next victim. It suggests that we are both central and peripheral to a universe that plays by its own rules no matter how hard we try to exert control.